After recent events, there is now this fascination with the relatively untouched world of Cuba. The allure of finally being able to have something after being told you couldn’t has made Americans go giddy with excitement. They can finally bring back the fabled Cuban items. Cigars, rum, beer, you name it and it comes across this border now. The people who haven’t left the island are rooted in a deep culture that not even the government could break and it shows through in their cocktails. While there is a huge debate on which of the two major beers of Cuba is better, Cristal or Bucanero, the cocktails have firm roots and the only thing debated is the rum used. A lot of the key components to a Cuban cocktail contain one or more of these things: the freshest fruit, quality rum, and a well-balanced simple syrup. The inspiration for the grapefruit cocktail comes from Cuba being the third largest producer of grapefruits in the world and it’s also one of their staple citrus crops along with oranges. It is like a rum margarita in a way but uses honey instead as a sweetener to balance the drink. 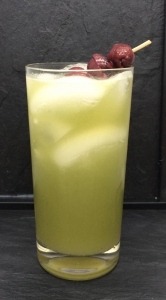 The cucumber lemonade drink was actually a play on a drink I made for a class competition in culinary school, but works here giving a nod to the open-air fruit and vegetable stands found throughout Cuba. The combination of fresh cucumber, tart lemon, sweet rum and salty brine makes for a smooth sipper that works for both at the bar and at the beach. Combine all the liquids and honey in a blender and blend until honey is incorporated. 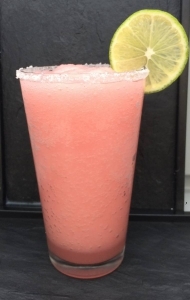 Add equal amount of ice in blender and blend until a smooth slush. Garnish with a salt rim and a lime on the side. Halve the cucumbers and scoop out the seeds and discard. Cut the cucumber in chunks and put into a blender with the skins still on. Blend with just enough water to have it blend easily and strain out the liquid into a pitcher. Essentially you are making a cucumber water by straining out the pulp. The pulp can be reserved and used in spreads and dips. You will have more cucumber juice than 8 0z so reserve any leftover in the refrigerator. Combine all liquids (cucumber water, rum, etc.) in a cocktail shaker and shake with ice until cold. Pour in high ball glass garnished with olives and hot sauce.